Key Findings from the DOE’s 2011 Wind Technologies Market Report show that the United States was second to China in wind power growth in 2011, producing roughly 6.8 gigawatts of new wind power capacity. Facing looming policy uncertainty beyond 2012, the U.S. remained one of the fastest-growing wind power markets in the world in 2011—second only to China—according to a new report released by the U.S. Department of Energy and prepared by Lawrence Berkeley National Laboratory (Berkeley Lab). Roughly 6.8 gigawatts (GW) of new wind power capacity were connected to the U.S. grid in 2011—more than the 5.2 GW built in 2010, but below the 10 GW added in 2009. Driven by the threat of expiring federal incentives, new wind power installations are widely expected to be substantially higher in 2012 than in 2011, and perhaps even in excess of 2009’s record build. • Wind is a credible source of new generation in the U.S. Wind power comprised 32% of all new U.S. electric capacity additions in 2011 and represented $14 billion in new investment. Wind power currently contributes more than 10% of total electricity generation in six states (with two of these states above 20%), and now provides more than 3% of total U.S. electricity supply. • In spite of the lack of policy clarity, wind turbine manufacturers and their suppliers continued to localize production domestically in 2011. As a result, a growing percentage of the equipment used in U.S. wind power projects is being sourced domestically: 67% in 2011, up from just 35% back in 2005-2006. However, Ryan Wiser, a Staff Scientist at Berkeley Lab and co-author of the report, notes, “behind these positive headline numbers, the domestic wind industry supply chain is currently facing severe pressure, due to uncertain prospects after 2012.” Specifically, profit margins have been declining and concerns about manufacturing overcapacity have deepened, potentially setting the stage for significant layoffs if demand for turbines (for post-2012 delivery) does not pick up. • Turbine scaling has boosted wind project capacity factors. Since 1998-99, the average nameplate capacity of wind turbines installed in the U.S. has increased by 174% (to 1.97 MW in 2011), the average turbine hub height has increased by 45% (to 81 meters), and the average rotor diameter has increased by 86% (to 89 meters). This substantial scaling has pushed average capacity factors among new wind projects higher over time, though the increase has been mitigated in recent year by significant curtailment of wind energy output in some regions, along with a trend towards wind developers building out lower wind speed sites. • Falling wind turbine prices have begun to push installed project costs lower. Wind turbine prices have fallen 20 to 30% from their highs back in 2008, but this decline has been slow to show up in installed project cost data, which only began to turn the corner (on average) in 2011. Data from a preliminary sample of wind power projects being built in 2012 suggest further reductions in installed project costs. • Lower wind turbine prices and installed project costs, along with improved capacity factors, are enabling aggressive wind power pricing. Grouping projects according to the year in which they signed a power purchase agreement (PPA) makes it clear that wind power pricing peaked among those projects that executed contracts in 2009 and has fallen substantially since. Among a sample of wind power projects with contracts signed in 2011, the capacity-weighted average levelized price is $35/MWh, down from $59/MWh for projects with contracts signed in 2010, and $72/MWh for projects with contracts signed back in 2009. • Looking ahead, projections are for continued strong growth in 2012, followed by dramatically lower but uncertain additions in 2013. With key federal incentives for wind energy (including bonus depreciation and a choice of the production tax credit, investment tax credit, or Section 1603 Treasury cash grant) currently slated to expire at the end of 2012, new capacity additions in 2012 are anticipated to substantially exceed 2011 levels—and perhaps even the record high set in 2009—as developers rush to commission projects. 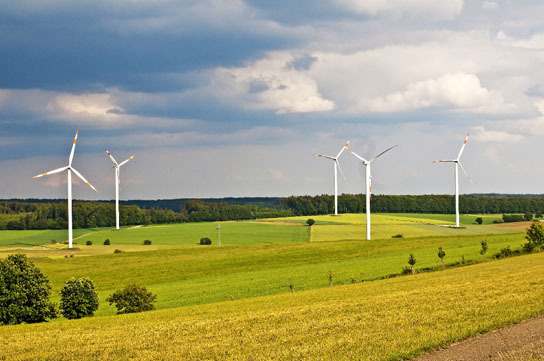 Be the first to comment on "Key Findings from the DOE’s 2011 Wind Technologies Market Report"